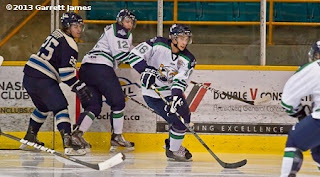 24 hours after Michael Santaguida shut out the Langley Rivermen in Game 1 of the Mainland Division Semi-Final, Rivermen goalie James Barr returned the favour, stopping all 42 shots he faced to lead Langley to a hard fought 1-0 win in Game 2. The victory marked the first ever playoff win for the Rivermen. The opening frame was a cagey period with both teams battling hard defensively. Santaguida and Barr were both called upon to make key stops early as the goaltending battle from Game 1 carried over into the second game of the series. After 67:30 of playoff hockey without a goal, Langley finally found the back of the net when Evan Campbell beat Santaguida from the bottom of the right circle on the power play to give the Rivermen a lead they would never relinquish. The game opened up a bit in the middle frame as the teams traded chances, but once again the two goalies were equal to the task. The rough play picked up in the second period as well, and a parade to the penalty box ensued, although many of them were coincidental penalties and each team only had one power play in the period. Barr was the story of the third, turning aside all 17 shots he faced – many of which were highlight reel saves. His best stop of the game and a save of the year candidate came when he committed grand larceny by stoning Michael Stenerson on a two-on-one chance that looked to be a sure goal. The Eagles thought they had tied the game later in the period when Adam Tambellini had a golden opportunity in front of the net, but Barr made a fantastic stop, pulling the puck off the goal line with his glove. Surrey pulled the goalie late in the third looking for an equalizer, but the puck stayed out of the Langley net, and the Rivermen evened the series at a game apiece. The losing team had the majority of the shots for a second straight night as the Eagles finished ahead on the shot clock 42-38. Surrey was officially 0-for-2 on the power play although the second man advantage was only six seconds long as it came in the dying seconds of the game. The Rivermen went 1-for-2. The teams will have a day off on Sunday before meeting on Monday evening at the Langley Events Centre for what could prove to be a pivotal Game 3. Face-off on Monday is at 7:15pm.